In a month’s time I’ll be spending a week with my family. Folks, sibling, husband, cousins, etc. As we actually like each other, most of us are looking forward to this time together. It’s an anomaly, I know. I’ve been coming up with numerous recipes for us to share while visiting, and I’ve been searching far and wide for inspiration. 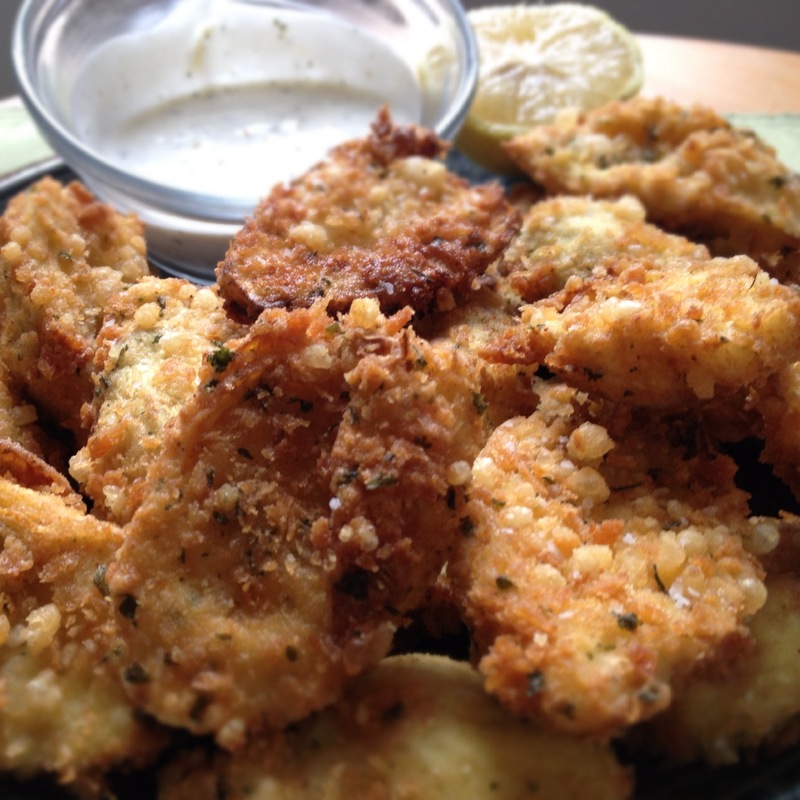 One of the many recipes I wanted to attempt to recreate was fried artichoke hearts. When I was in college…hmmm. You know, I was going to write “When I was in college I spent some time in Arizona…”, but now that I’m long graduated I can honestly state it more clearly: While I lived in Arizona for a few years I went to college. Like one goes to the gym when they’re not really into it. Like it was a hobby or something I told people I did to keep them off my back. Anyway, the point is that while I lived in Arizona, working odd jobs instead of attending class regularly, one of the ways I would treat myself from time to time on the great road of finding my way, was a night out at the Prescott Brewing Company. One of my faves on their menu are these little crispy artichoke hearts. I decided to make may own version, packing each bite with a little more flavor, attempting to bake them instead, and serving them a bright and lemony aioli rather than ranch dressing. Just a side note here: I’ve used both the whole and quartered artichoke hearts. I’ve found halving the whole artichoke heart makes for a much more toothsome bite than the pre-quartered options. They’re smaller, thinner, and all around less appetizing. 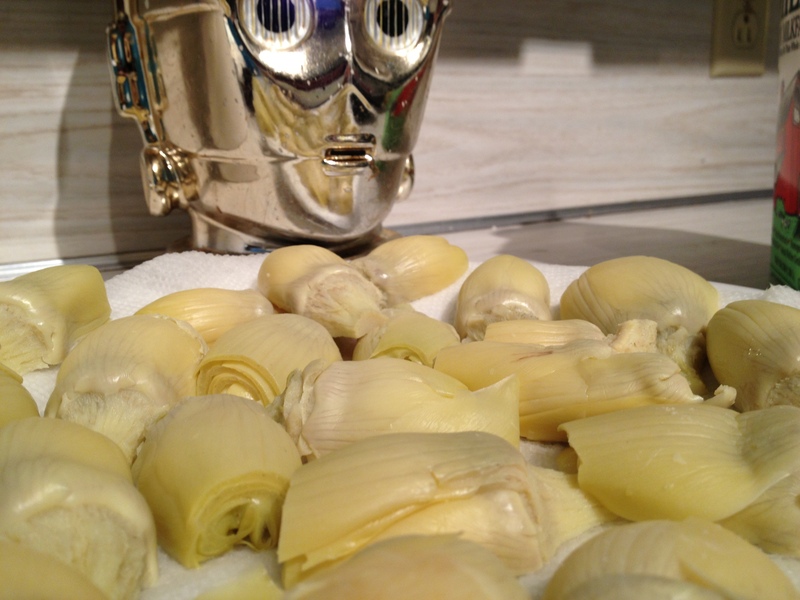 Drain the cans of artichoke hearts. Gently halve the hearts and lay out on a paper towel for about an hour to dry out a bit. Whisk together the eggs and milk. In a separate plate (I use an 8×8 pyrex) combine the flour, panko, lemon zest, garlic powder parsley, and Parmesan. Start heating up your vegetable oil to 325 degrees. Delicately spear an artichoke halve with a fork. I found it best to poke from the side out, which helps the petals remaining on the choke stay together. Dip your speared piece into the egg/milk mixture quickly, allowing the excess to drip off a second before coating in the panko mixture. I found it easiest to drop the artichoke heart piece off of the fork into the center of the panko and flour, and then tossing the dry ingredients over the heart. You want the artichoke chunks to be evenly coated, but you don’t want that coating to be very thick. Once coated, set aside until you have an full batch to start frying. Once your oil reaches temperature, fry the artichoke hearts halves for 2-3 minutes per side or until golden brown. They do brown very quickly. Once golden and crisp move to a paper-towel covered cooling rack and sprinkle lightly with salt. Let rest about 5 minutes. 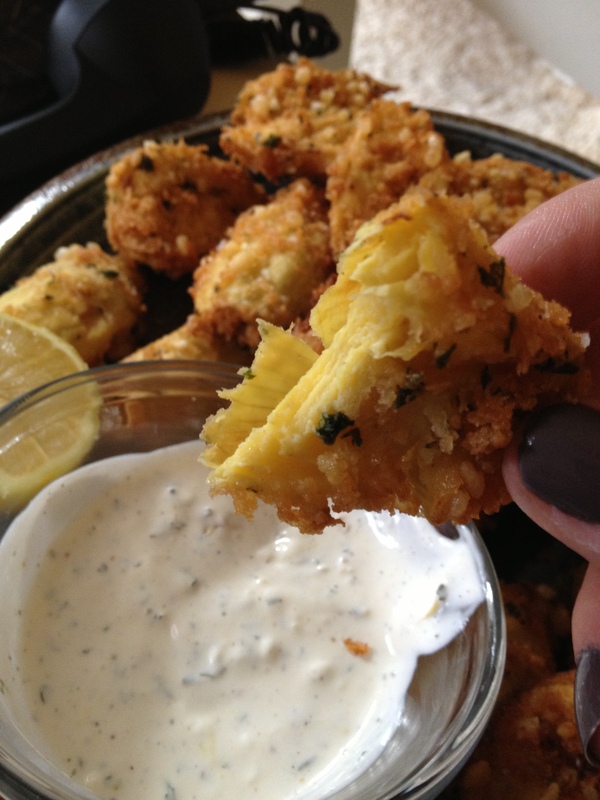 For the dipping aioli, whisk all the ingredients together and serve with the artichokes. This creamy dip is extremely addicting. You may want to double the dip recipe if you’re serving these at a dinner party. I served mine as an appetizer to a vegetarian dinner and the crispy artichokes, with the bright creamy sauce went beautifully with both our chilled white wine (I think it was a Pinot Grigio) and a crisp hard cider. 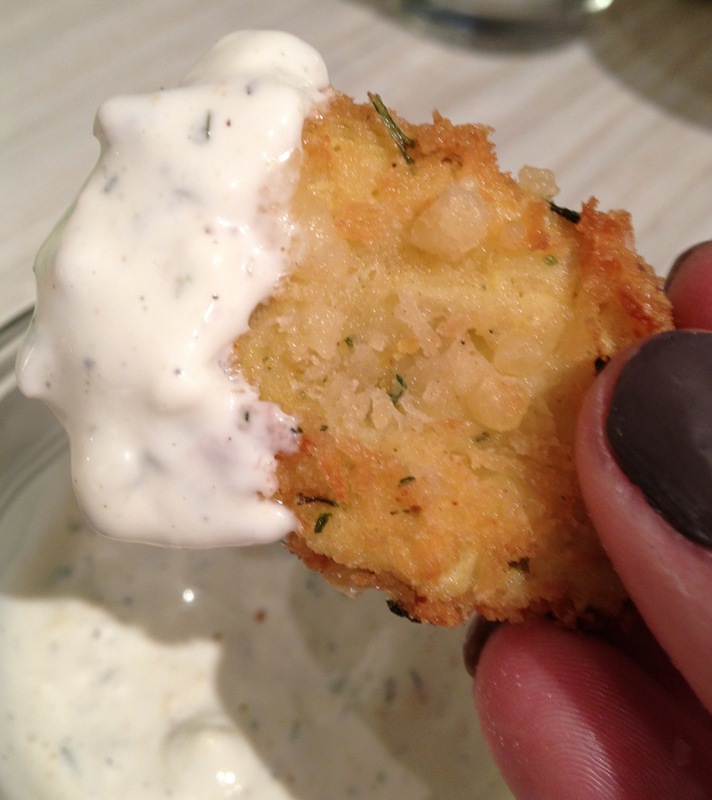 This entry was posted in Comedy, Entertainment, Geek Chef, Humor, Recipes and tagged aioli, appetizer, artichoke, baked, dinner, family, fried, hearts, holiday, party, vegetarian.